CROSBY – The Crosby-Huffman Chamber of Commerce will host a Fourth of July Parade, along FM 2100. The parade will begin at the Crosby Fairgrounds and head north along FM 2100. Lineup will begin at 9 a.m. with the parade starting at 10 a.m. The parade will feature cars, floats, music and candy. Congressman Ted Poe is also expected to attend. To enter the parade or for more information, call Joe Anselmo at 281-328-7173 or Bob Ward at 281-427-9269. BAYTOWN – The Baytown Parks and Recreation Department will hold a festival with live music at Bicentennial Park. The festival will be from 2 to 10 p.m.
Live entertainment will be: 2:15-2:30 p.m. 6th Calvary Historic Society Civil War reenactment; 2:30-4 p.m. Granger Smith; 4:15-5:15 Lee College Concert Band; 5:15 to 6:15 p.m. Bayou Band Big Band; 6:15 to 7:45 p.m. The Coastliners; 8-9:30 p.m. Blake Sheldon at and 9:30 p.m. will be a fireworks display. Is it time to consolidate your assets? If you’re like many people, you keep investment vehicles in different places. You might have started traditional IRAs with two or three financial-services providers while buying some stocks from still another. And you may also have purchased a fixed annuity from an insurance company. As long as you keep track of all these accounts, you might think it doesn’t matter where they are “housed.” However, if you scatter your investments here, there and everywhere, you could end up in uncharted territory when it’s time to pull everything together. What are some of the potential problems of keeping your investments at a variety of different institutions? For one thing, despite your best intentions, you could actually forget about one or more of your holdings. State treasurers’ offices regularly advertise “unclaimed” property, including investments. People move, change jobs, divorce and undergo all sorts of changes in their lives – and sometimes, they leave their investment dollars behind. But if you consolidate all your holdings with one financial services provider, you can keep tabs on your investments without much trouble. Of course, you could be a highly organized person – someone who would never “misplace” financial assets, no matter how dispersed. But, even so, your far-flung investments could slow your progress toward your important financial goals. If you maintain several different accounts, without a central focus or unifying philosophy, you could end up with redundant or inappropriate investments – a costly mistake. On the other hand, consider keeping your investments with one firm and work with one financial professional – someone who knows your family situation, risk tolerance and investment preferences. – Doing this may help you make steady progress toward your long-term objectives. A qualified professional can look at how all your investments work together, and make recommendations, as needed, to help improve your portfolio’s performance within your stated level of risk. Consolidating your various investment accounts can also help you in the area of required minimum distributions (RMDs). As you may know, you need to begin taking RMDs – from traditional IRAs and 401(k)s or other employer-sponsored retirement plans – in the year in which you turn 70-1/2. You can withdraw more than the RMD, but, as the word “required” suggests, you can’t withdraw less – and you could face tax penalties for taking less than the minimum or failing to take the RMD on time. Consequently, if you have multiple IRAs and employer-backed plans, you’ll have to “reel them in” at the right times to make sure you’re making the proper RMD moves. So, there you have it – some reasons to consolidate your investment accounts. Consider taking this step soon to simplify your life. HARRIS COUNTY – A Harris County Grand Jury, last week, said it would not indict three Crosby teens on felony explosive charges. During Spring Break, three teens were arrested after a witness reported a bomb has exploded near his home. According to Harris County Precinct 3 Constable Ken Jones’ office, the teens had placed some sparkler-type fireworks down an armadillo home. This caused an small explosion, alerting the homeowner. The teens were apprehended by deputies from the constable’s office, and taken to the Harris County Jail. The teens spent two days in jail before the parents, who asked not to be identified, paid the $12,000 each to have them released. The Grand Jury said that the incident seemed to be more of a prank that of criminal intent. Despite the ruling, Jones warned caution when using fireworks, he said that they can still be dangerous and that misuse can often result in consequences that are unexpected as the teens found out themselves. 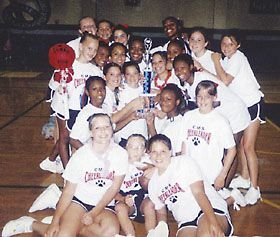 The 2005 – 2006 Crosby Middle School cheerleaders recently attended a NCA summer camp where they received the Top Team Award. The squad competed against 10 area schools by performing a camp chant and a stunt cheer. For receiving the Top Team Award, the cheerleaders were invited to perform in the halftime show of The Hula Bowl in Hawaii. The 7th grade cheerleaders are Ana Fernandez, Tiffany Gaspard, Alexia Gwinn, Erin Henry, Brooke James, Lauren Johnson, Destany Jordan, Mary Landers, Kirsten Minter, Tyra Singleton, Raysia St. Julian, and Jessica Travis. The 8th grade cheerleaders are Kristin Acrey, Shalanderia Arceneaux, Nevate Bailey, Cheryl Barrett, Jena Bletsch, DeLynn Michalsky, Shantaya Mitchell, Kacy Morris, Lacy Morris, Ciera Sennett, and Lauren White. The Cougar mascot is 8th grader, Courtney Richards. Individual awards were also given during the camp. Nine of Crosby’s cheerleaders were nominated for a chance at receiving an All-American Cheerleader award. The 7th grade All-American nominees are Ana Fernandez, Tiffany Gaspard, Alexia Gwinn, Brooke James, Kirsten Minter, and Tyra Singleton. The 8th grade All-American nominees are Kristin Acrey, Nevate Bailey, DeLynn Michalsky, Kacy Morris, Lacy Morris, and Lauren White. After performing in front of a panel of judges, the following CMS cheerleaders received the All-American Cheerleader Award for displaying superior qualities of cheerleading in leadership, showmanship, and technique: Ana Fernandez, Tiffany Gaspard, Alexia Gwinn, Tyra Singleton, Kristin Acrey, and Lauren White. CROSBY – Not as much money is being spent on the Texas lottery as in the past, learned attendants of a luncheon June 16. Robert Heath filled in for Regan Greer, Director of the Texas Lottery Commission, at the Crosby Community Center during the Crosby Huffman Chamber of Commerce monthly assembly. Heath was formerly with the Texas Railroad Commission before going to work on the Texas Lottery Commission. Greer may have been elsewhere explaining why payoffs were lower than estimated jackpots. About 70% of the lottery’s revenue is now from scratch-off tickets. The lottery experienced a dramatic increase in scratch-off tickets sales when the scratch-off tickets included up to $30 per ticket with a 50-50 chance of the player getting his money back. About 30¢ of every dollar spent on the Texas Lottery goes to school funding. More accurately, $1.1 billion of $3.5 billion in 2004 went to fund to schools. In an aside, Governor Perry, that same day, indicated the school funding bill (that called legislators back to Austin) should give teachers a raise and reduce property taxes. Not being able to count on a huge lottery increase may cause that lack of funding to be recovered from other taxes. Sunday, June 19, at about 2:00 p.m. an ATV flipped from the beach near the bridge over the San Jacinto on Beaumont Highway. A 44 year old man received a gash to his head. Crosby Volunteer Fire Dept. 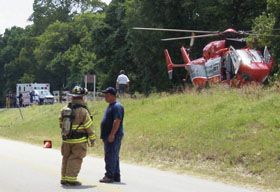 and ESD#5 teamed to effect a rescue and road closure for a LifeFlight helicopter. On June 24 and 25, a cook-off benefit for the Crosby Volunteer Fire Dept. at Texas Wild Sports bar, 3615 FM 1942 will feature not only food, fun and games for the kids but Friday night live music, and Saturday, an auction and raffle. CROSBY – Representative Joe Crabb while attending the Crosby Fair & Rodeos Parade on June 11 was surprised to hear that he was being summoned back to Austin after the State Legislature had appropriated $1.6 billion dollars more for schools this year than last. Despite the recall, Crabb said the session was not without its success. Over 700 bills were passed this session, which Crabb referred to as “a typical session compared with recent sessions.” Among these successes, he said, was the parental consent for abortion bill. Crabb, who also spoke recently to the Highlands Rotary Club, said the school finance became a hot issue after it was declared illegal first by a Travis County District Court and later the Texas Supreme Court. Perry’s use of his line-item veto authority means legislators will have 30 days to complete the task left unfinished in the regular session that ended in May. Perry has been meeting with the leadership since then to negotiate a compromise on education reform and property tax reduction bills. The special session also will afford legislators the opportunity to fund textbook purchases for schools and classroom technology. “Make no mistake about my message today: While I respect the deliberative process and will continue to welcome and engage in negotiations, this issue has been studied and debated long enough and now it is time to act,” Perry said. Without a special session, about $2 billion that had been intended for teacher pay raises, education reforms and other school priorities would have gone unused instead of going to schools because House Bill 2 didn’t pass. These funds cannot be redistributed under budget execution authority, meaning they can only be spent on education if appropriated during a special session. And without additional legislative action, textbooks would remain sitting in warehouses rather than in school children’s hands. Perry assured parents, teachers and school children that there is ample time for legislators to finish the task and for schools to open on schedule, with better funding, better teacher pay and, most importantly, critical reforms that will ensure more children are challenged to achieve in the classroom. Perry also vetoed about $1.7 billion in all funds for other line-item appropriations from the 2006-07 spending bill, freeing up a portion of these funds for property tax relief or education funding and making legislators’ jobs easier in a special session. In his veto proclamation, Perry noted that in his State of the State address in January, he said Texans have a right to an unambiguous and understandable state budget that shows how tax dollars are spent. “Senate Bill 1 continues the recent practice of combining numerous programs into enormous line items of appropriation that allow too much discretion in the use of public dollars,” Perry said in his veto statement.  $440 million for the Federal Medicare Give-Back. These are savings that the State of Texas has accrued through efficiencies in operating the “dual eligibles program” for persons who are eligible for both Medicaid and Medicare services. A complete copy of the Governor’s line-item veto proclamation will be available at www.governor.state.tx.us. HOUSTON – At a ceremony last month, 312 outstanding Houston-area graduating high school seniors filled the floor of Reliant Stadium. The Houston Livestock Show and Rodeo honored these exceptional young Texans for their achievements with a scholarship presentation, totaling $3.744 million on the evening of May 24, 2005. Each recipient received a four-year, $12,000 scholarship from one of three Show scholarship programs – Metropolitan, Opportunity and School Art. The Houston metropolitan area has long supported the Show’s educational endeavors, and these scholarship programs were designed specifically to boost the educational opportunities for students in the Show’s home community. The largest of the Houston Livestock Show and Rodeo’s programs, the Metropolitan Scholarships are awarded to 197 students in Brazoria, Chambers, Fort Bend, Galveston, Harris, Liberty, Montgomery and Waller counties, and are based on academic achievement, leadership, community involvement and financial need. The Opportunity Scholarships are based on academic achievement, leadership and community involvement, and are weighted for financial need. Nearly 1,200 students from Brazoria, Chambers, Fort Bend, Galveston, Harris, Liberty, Montgomery and Waller counties applied for the scholarships, and 100 recipients were selected. Receiving scholarships from Crosby High were Randy Allen Johnson (Metro) and Adam Spencer Cook (School Art). From Goose Creek were: Robert E. Lee HS: Tram Yen Pham (Metro) and from Ross S. Sterling HS: Gabriel Emigdio Barragan (Opp), Matthew Chase Casey (Opp) Kyleigh Noel Parker (Metro) and Jeromey Scott Thornton (Metro). From Willie J. Hargrave HS were Jenna-Rose Ascherl (Metro) and Joel Ray Burgess (Opp). In order to be eligible for a School Art Scholarship, applicants must have achieved Best of Show, Gold Medal, Special Merit or Gold Star Finalist status at the district level in the Show’s School Art Program in 2005. These scholarship recipients must demonstrate the same academic achievement and leadership as Metropolitan and Opportunity winners. Fifteen School Art Scholarships were presented. The Metropolitan, Opportunity and School Art scholarships are part of the Houston Livestock Show and Rodeo’s educational commitment of more than $7.5 million annually.